College Coach? Click here to view all of Jessica's information. Hello, I'm Jessica! My current goal as an athlete is to be a great team member to my club and high school team. I love to work hard and to inspire others to work even harder. A team that works together wins together. I'm all about good sportsmanship and cheering my teammates on. I'm quite the talker off the court and especially on the court! I make sure that I communicate with my teammates. You could definitely categorize me as sociable. 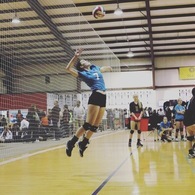 After my third year of club volleyball and attending Lamar University's advance camp for the third time, I decided that I would strive to work towards becoming a college player. For my fourteenth birthday, my mom and I traveled to Louisiana to watch the Southeast Volleyball Conference. It was a blast to watch and it definitely inspired me more to play volleyball in college. After watching the conference, I attended as many Lamar games as possible. I'm very dedicated to my school work and I am currently ranked fifth out of 172 in my class. If I pushed myself harder, I'm sure I could bump up a few spots. I would be a good candidate for your team because I'm severely dedicated to playing this sport and I'm a coachable athlete. I love effective criticism that makes me a better player for the team. I hope that you'll consider me as a great candidate for your team! While attending the skills camp, I was invited back to the advanced camp. Started in during my 7th grade. My events are hurdles and triple jump. Starting playing T-Ball at the age of 5 and currently play for my high school team. I play 2nd and left field.